I hope I'm wrong, but I fear I might not be. Thanks Qazz. Well, some things, like family, are more important even than calculators, as weird as thing to say that that might seem to you. Mmm...I spy a TI-85! Those are good calculators. Yup yup, I like it. I actually need to post an updated picture of my collection; I got a new 83+SE today. I think I still have two SEs pending being repaired, if you include this one. One of my friends has an 83+ SE with a Viewscreen port. Only problem is the link port's busted. I'm going to solder it back in for him soon (I've repaired link ports and they're a very easy solder job once the calculator's opened up). Yeah, that was actually my very first hack job on a calculator, re-soldering the link port on my very first, trusty TI-83 (not plus) calculator. I trust you have the necessary Torx-6 screwdriver? I have a couple of alan wrenches that fit the torx-6 socket. I'm not sure of the size though. It's pretty small, maybe 1/16" or something. Excellent, glad to hear that you have the proper tools on hand; best of luck with the fix! Updates on the TI-83+SE that arrived yesterday: unusually, it doesn't seem to be the usual ribbon cable failure, nor does it appear to be water damage. TI-Connect can't detect the calculator over a SilverLink. The investigation continues. Necro-bump. 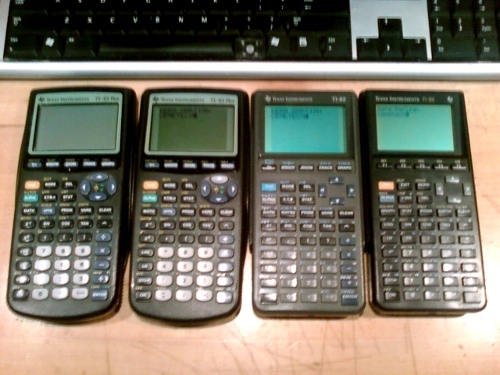 Two new calculators arrived today: a TI-83+SE ($10.68 with shipping) and a TI-83+ ($13.00 with shipping). Both devices are in good cosmetic condition, although the TI-83+ is missing its slidecase. The TI-83+ is one of the earliest revision A devices (probably has a discrete z80). The LCD powers on and off, but nothing is visible. TI DeviceExplorer finds it. The TI-83+SE does not appear to power on, and is not visible to TI DeviceExplorer. Let the repairs commence! Edit: Attempted hot-air remelting of the ribbon cable on the TI-83+, which helped some of the traces. 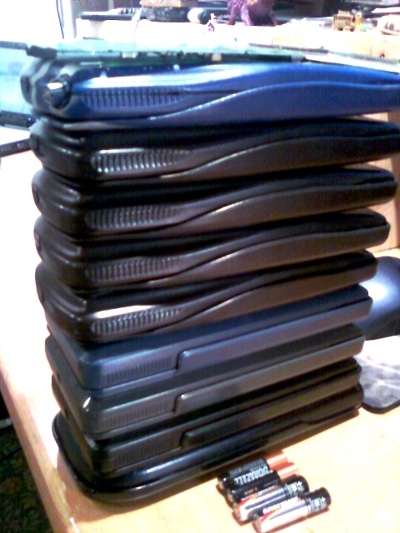 I ended up replacing 8 of them; fully functional 1.12 TI-83+ once again. And as I suspected, it has discrete RAM and a z80. Managed to fix the TI-83+SE through something I did very much not suspect. Sadly, it wasn't the same thing that is wrong with my other three nonfunctional TI-83+SEs, which remain unfixed. This afternoon, I got a broken TI-82 that I purchased for about $3 with shipping. It does not power on; disassembly reveals both acid damage on the battery side of the board, and liquid-triggered deterioration on the key side. I'm trying to find any discontinuities and repair them. If I fail, I plan to try to connects its functioning LCD to an LCD-less TI-83+ mainboard that I have and make the world's first TI-83+ with a TI-82 LCD in a TI-82 case. What was wrong with the 83+SE you did fix? One of the components had failed in a very predictable way; it was so obvious that it's not something I would have thought of had I not poked around with a multimeter. I don't want to be super-specific so I don't jeopardize the prices of the broken TI-83+SEs that I pick up on eBay. Indeed. Anyway, this TI-82 is turning out to be stubborn. I found that part of the damage divided the ground plane, such that half of the ground plane was 0.6V higher than the other half. A quick 30-gauge wire bridge fixed that, and another temporary bridge fixed the broken trace linking the ON button to the ASIC. However, it still just flashes lines on the LCD when I put in the batteries and when I press ON; no screen activity or link activity yet. I still really like my TI-83+-with-a-TI-82-LCD plan, although I'll need to reconfigure the bottom of the too-long TI-83+ PCB. *bump* Haven't finished working on that TI-82 yet; I'll examine it again later. On a more exciting note, I got a batch of ten TI-82s, one TI-83, and four TI-83+s yesterday, most of which I'll probably be fixing up and offering out, as my collection doesn't need that many TI-82s. © Copyright 2000-2019 Cemetech & Christopher Mitchell :: Page Execution Time: 0.556481 seconds.